The dark line under my thumbnail isn’t dirt but a bruise! I wanted fine Rouleau strips to be a key feature of my tablecloth dress, the design of which is based on a client’s gently draping number in viscose. But I just couldn’t get the strips to turn right side out. I tried every method – from funnelling to sewing thick thread to the inside to making them so wide that they really didn’t much resemble Rouleau strips at all. My fabric was just too tough to co-operate. I made so many, the strips gradually getting wider and wider until they no longer resembled Rouleau strips at all. After several hours of progressing in mere centimetres and in a perverse way enjoying it, my thumbs became too sore to grip and I came to my senses asking myself: if I was a costumier, would these wasted hours be tolerated by whoever was paying me? Of course not! So to Plan B which was to make bias binding instead. I cut the strips a mere 2cm wide and pressed until the finished size was 0.5cm. With this method, unlike with Rouleau strips, there is no danger of wrinkling. Even better, just as when I made the Colette Dahlia dress, the binding was used not just to construct the straps but to enclose the neckline too. I hope these photos – taken in bright light of what was almost mid-day – do justice to this dress. I love everything about it: the deep blue, the way my skin shows through the gaps (it’s a much better contrast then when the dress was white) and I love how the sun casts interesting shadows about my legs as it peers through the lacing. One advantage of this fabric being somewhat of a toughie is that it doesn’t crease as much as typical dress linen. The only thing that went majorly wrong is that that original back opening that goes down very sensually to the waist – shown in the pre-dye dress here – gaped open too much when I put it on: clear proof that you can’t copy a dress if you use a vastly different fabric. So I spent some time inserting a lapped zipper and now the back looks like this. Thanks Etemi for this most fun and creative challenge! I found the tablecloth patterning limited my choices when drafting and resulted in something not so much like the target design but just as good and certainly more wearable! The deadline for Etemi’s challenge is this Saturday. I can’t wait to see what the others have done..
P.S. If you’ve lost your keys and they look like this, they’re on the beach at Greenwich! The barbarians are coming! They’re tearing hand-made heirlooms and (gasp)…. turning them to beach dresses! Yes, those flimsy things destined to fade and be destroyed by suntan lotion in a mere summer or two. #usedtobeatablecloth is a sewing challenge where we turn a tablecloth or some forgotten piece of household linen into something summery to wear. 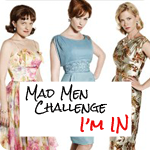 I’m taking part because I saw the lovely Little White Dress made by Etemi, the challenge host who blogs as The Secret Costumier, but also because on my second foray to the charity shops in search of suitable material, I got really lucky. I found a tablecloth very similar to the one Etemi used. I don’t know whether it is indeed handmade – I doubt anyone would have parted with it if that’s the case – but it’s beautiful, if slightly spoilt by a light stain or two. I found it folded on a rail and as I opened it up wondering if I could use it, an older woman came over admiring it and we struck up a conversation as she wondered how many hours of work went into it. I thought the tablecloth needed a chance of a more worthy owner and did actually ask the woman if she was interested in buying it. She declined, saying she couldn’t be bothered with all the ironing. So now it’s belongs to the barbarian. Does it look familiar to you? I’m pretty sure that in Croatia every house proud woman of a certain age has one: I seem to recall drinking glasses of squash at numerous tables adorned thus. Soon as I’ve made it into a dress I will dye it a dark blue because I’m very much missing my dark blue perforated summer dress that Django the Hun* shredded. I did a test with some remnants of dye powder to see if it would take and it worked very well. Not only is the tablecloth made of a natural fibre (linen) but all that thread must be cotton as it took the dye too (I was hoping it would stay white as polyester thread does as the contrast would have looked beautiful). My plan is to make a version of a client’s dress that I altered a year ago. I thought it was quite chic. Being twice the age of the client, my dress will be less revealing but I’m aiming for a similar arrangement of rouleau strips, perfect for exposing the shoulders to the rays. No bra will work with this but I don’t care…. I prepared the pattern in next to no time using my block. Inevitably, my drafted pattern doesn’t quite match up to the threadwork pattern of the tablecloth and I have already had to rethink the length of the skirt and the width too. You could have a lot of fun with this, working out the different possibilities of where to place the laced parts. Etemi is very lovely and her blog well written with clear, very appealing presentation. We met in June in Goldhawk Road but it turned out I’d come across her before; her refashioned shirt was one of my favourites in the Refashioners Challenge 2015. Do join us if you can: there’s ten days before the deadline and it’s a quick project – provided you have the right tablecloth. 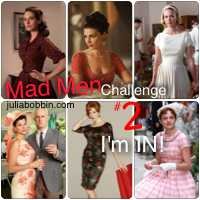 The challenge post has all the details as well as helpful hints and images to inspire. I have cut out my pattern pieces ready for the making and look, there’s enough tablecloth left for one or two more dresses! *not a barbarian but a Hungarian Viszla! Originally I wanted to make a day version of the Six Nap Dress with a black bodice and a tartan skirt: something weighty that would eliminate the need for many metres of fabric. I learnt from the dress’ designer, Masayo Yasuki of dogstar clothing, that the skirt has 8 metres of organza and 6 metres of lining. With so much silk in there, I figured there had to be something very simple and not fiddly in the way it’s designed, otherwise surely the dress would be more expensive than it was (it retailed at £380). But what went on in there? Lots of deep pleats, all the same length (which wasn’t obvious to me till Stephanie pointed it out), and then two extra squares of fabric inserted, one at the front and one at the back, to give those bias dips. It added up: two more metres in the organza than in the lining. I had 1.5m of very cheap (but not all that nasty) white polyester lying around. It feels soft but has weight and movement… and a slightly non-flat, puckered texture that I’ve recently noticed on quite a few H&M and TopShop garments. I attempted to tye-dye it – imagine the contrast of white against a patterned deep blue, had it worked. Unfortunately it doesn’t get very wet, this fabric, and so the overall effect is a kind of faded blue with a few interesting patched of deeper colour which you probably can’t see. One difficulty I’ve encountered on this project is that most of the draping and pinning of the skirt during the experimental stage has been done with the fabric on the crossgrain, for convenience’ sake. That way you get the width for all those pleats. But I was never happy with the fall of the fabric so this time I cut it up into 72cm pieces and joined them. Then I pressed up and hemmed everything. I attached it to the bodice, pleating going a bit slapdash by this stage, and I also attached it to the long side zip. Ah, the joy of finally being able to try it on! Then I ripped open the original joins (one at the front and one at the back) to insert kite-shaped pieces which hang on the bias, dipping just below the hem. But they’re too small to make an impression of a deliberate style. In a previous comment, Ruth joked that her own version of the dress is more of a Three Nap than Six. In which case I better name this One. I don’t think I’ve ever made anything so sloppy (inside it has the finish of a Great British Sewing Bee garment, all unfinished seams and unmatched thread!). Having conceived this challenge as far back as in May, I’m keen to move on to other projects. But this half-hearted draft isn’t a good enough note on which to exit. So I’m going fabric shopping and maybe the right tartan or even organza will show up. Though I’d be much more happy to spend money on the latter if I felt I knew what I was doing. Firstly, may I thank you on behalf of Connie for your kind words of support in her decision to cut her hair short and donate it, as well as to fundraise for the charity which uses the hair to make wigs for children who have lost theirs. I was so moved that this blog prompted many of you to sponsor her and leave lovely messages. Amongst the familiar names that I’ve got to know over the years and come to regard as friends, there were, much to my surprise, some unfamiliar ones from a few who outed themselves as readers! It’s very humbling and I thank you warmly. The cut was booked for Connie’s 12th birthday and I picked the best hairdresser I know, just in case. She did a pretty good job! We quickly got used to the new Connie; in fact it’s hard to believe she hasn’t always looked like this! When the salon manager heard what she’s up to, he gave the salon fee to the charity and the hairdresser, the brilliant Yvette, did the same with her tip. But donations arrived from all angles: friends, family, bloggers, the running community… The latest amount raised now stands at £429, more than twice the initial target. The day after, we flew to Canada. A first-time visit and a memorable trip which strengthened friendships and family ties… even if the children did want to disown me for making them walk long distances. I will write about the experience some day as I found it inspiring to people-watch in the streets of Ottawa, Toronto, Montreal and Quebec City. But first I’ve to comb through the hundreds of photos we’d taken. So I return to an imminent deadline for my own Six Napoleon Challenge. I’ve had feedback from all the participants and unless magic wands are waved over the weekend, the consensus is that probably only one dress has been finished in time to meet the deadline of this Sunday. Ruth, you’ve done it again! I can’t wait to see it, or rather, you in it. Does this mean that for the rest of us, the challenge is a failure? Well… not quite. Other dresses will come I hope. When they’re ready. I feel somewhat disappointed in myself in that I haven’t provided the inspiration or the know-how to enable the others to continue – leadership was never my strong point. But hopefully everyone taking part has learnt or expanded their skills in the process of trying. Wonderful news came from the west coast of Ireland this week, where my friend Jo is staying with her family … and a Bernina! You may recall that back on a teary day in June, Jo and I drafted the Six Nap bodice pattern to fit her. Afterwards, Jo made the bodice in a rose-print cotton and liked it enough to make it again. The second version is in a more brocade-like fabric from the stash (we think it might be an upholstery fabric). It was made to go over a RTW skirt. I asked if it’s comfortable to wear and was told yes, despite the asymmetry. Now Jo is on her third, I think this one calls for a skirt of its own. Well done Jo: I’m chuffed it worked! And now, my own experiments…. I draped following Anita’s method of cutting two stumpy shapes, sewn together at the short ends. This is similar to joining a circle skirt to a bodice except for the amount of pleating at the lowered waist. And the circle has been left a rectangle. I tried it out using pattern paper, joined to make a 2m x 1.4m piece. (I know 🙄 I try and live a green life then go axe down a tree, metaphorically). I even sellotaped back a 10cm deep hem. It was very noisy! But it’s the low dip of that corner that concerns me; it would reach my feet. I used graph paper (like this printable one) to try out some ratios. The first illustration is as in Anita’s tutorial in her guest post. The second is as in her suggestion of using 3m of fabric. I raided the charity shop for some bargain bed linen and used 3m to make this. It was more fabric that I could cope with, to be honest, though it helped to drape from the waist rather than the bodice hem. I will play with the graph paper and try to reduce the diagonal length of that mitred corner. There’s one more method to try. Now I’ve always suspected Stephanie to be really clever and was very impressed when in her last post she presented another interpretation of the Six Nap pleats. Which I’ll attempt next. This method will also result in a shorter length of the dip. But whether to go crossgrain and risk puffiness or lengthwise and risk showing lots of joins in the skirt?